Amazon is offering a good deal for those interested in purchasing the unlocked version of the upcoming Samsung Galaxy Note 9. 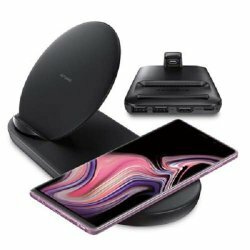 When you pre-order the phone through Amazon, you'll also receive a bundle that includes Samsung’s new Wireless Charger Duo and a DeX Pad as well. Those handy accessories total about $180 worth of free gear. Verizon is now starting to unveil some of the services it will deliver on its super-fast 5G network. According to a new Bloomberg report, Verizon will provide 5G customers either a free Apple TV box or free subscription to Google’s YouTube TV app for live television service. T-Mobile is now pushing new updates to the Galaxy S9 and S9+. One of the major improvements is the July 1, 2018 Android security patches. In addition, there are enhancements for the super slow-mo video and AR Emoji features as well as a fix for a black screen bug. The Galaxy S9 is being bumped up to software version G960USQU3ARG7, while the Galaxy S9+ is being updated to version G965USQU3ARG7. Pixel 2 XL Deal Alert - $300 off! Best Buy is offering an awesome deal with $300 off the Pixel 2 XL to celebrate another anniversary. In addition to that deal the regular Pixel 2 is $150 off. Now in order to get this bargain you will have to sign up for the Verizon monthly installment plan. Could this be the OnePlus 6T? We think so!